Here in New England, if you look carefully with a “pickers” eye, you may be lucky enough to come across artifacts from one of its signature touchstones from its historical past—fishing and whaling. These maritime treasures are sought after by collectors, and the demand for them isn’t fading away any time soon. A couple of years ago I went for a dive in search of antique bottles for my collection. I was in a small, coastal river, in about 15 feet of water, slogging along at the murky bottom. About a foot deep into the mud at the river’s bottom, my gloved hand ran across a lump of something that I could tell wasn’t a rock. I gripped it and pulled it up. In the swirling, dark brown silt I had stirred up, I couldn’t see a thing, so I swam to the surface and pulled it out of water, where it was draped with water lily vines and leaves. It was heavy, with a rock in the center, and I had no idea what in the world it was. But it looked very primitive. The rock was held in suspension by hand-cut dowels, amazingly snugged, kept in place on a wood-pegged crosspiece base. I showed it to some friends and they were as fascinated and perplexed as I was. Someone suggested I immediately begin treating it with linseed oil to preserve the wood, because if it had been underwater for a hundred years or more, the wood will likely disintegrate quickly when it hits the air. And boy was he right! It was becoming brittle within hours and it still is to this day. I oil it and it soaks the oil up like a sponge. Finally someone suggested that it was a small boat or dinghy anchor. And after some Googling around, sure enough, it is something called a Killick anchor. There are a couple of things that made this discovery especially interesting to me. One is that a Killick anchor can be traced back to the Vikings, according to what I’ve read. But in general, it is considered to be native to Newfoundland and the Maritime of Canada (which was visited by Viking sailors centuries ago). The New Hampshire coast is a few hundred miles south of Newfoundland, but French Canadians settled all around our area over the centuries, as well as Scots down the coast from the Maritime. So it’s not a stretch to think whoever crafted this anchor had the workmanship skills handed down from Viking ancestors. And speaking of workmanship, the other things that is amazing about this find is that the more you look at, the more impressed on becomes at the skill it took to make it. I would challenge anyone to replicate this Killick anchor using hand tools, or even with modern power tools of today, for that matter, and have it last for a couple hundred years without falling apart. The center piece at the top is a straight, hand-hewn dowel that has been carefully and perfectly split for ways, then spread apart just enough so that a perfectly tapered rock is gripped tightly by the wood. Then two slats of wood are dovetailed in an X at the bottom and pinned together by the split dowel, through drilled holes that fit perfectly. 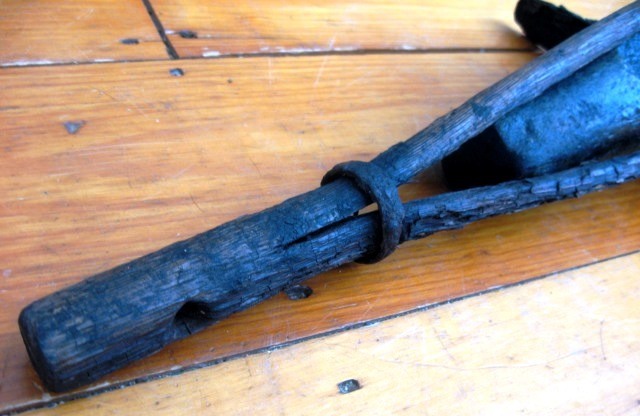 The only metal pieces on the whole arraignment is one round iron ring that keeps the split on the wood from traveling further up the dowel at the top. 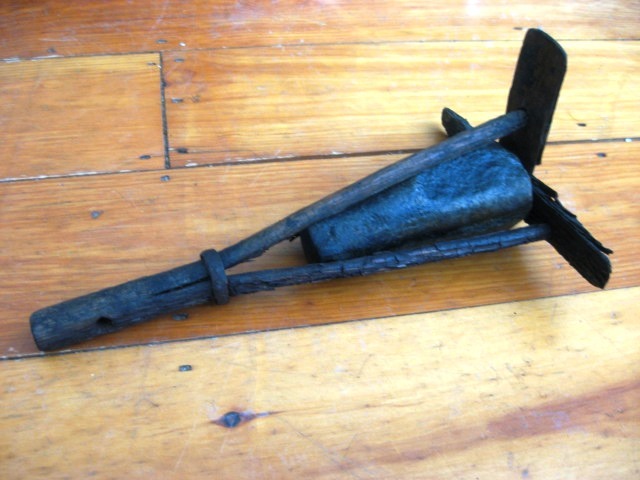 This is the only Killick anchor with this exact type of construction I’ve found while researching it, where the centerpiece is cut from one single piece of wood, as opposed to three or four pieces of wood tied together with twine. An item like this is impossible to value. For a collector or investor who has no interest in it, it is worth nothing. To a collector of historical maritime pieces, it could be priceless. If I someday decide to sell it, I wouldn’t know what to expect. I am hoping it ends up in a local museum, where its historical context can be documented properly. 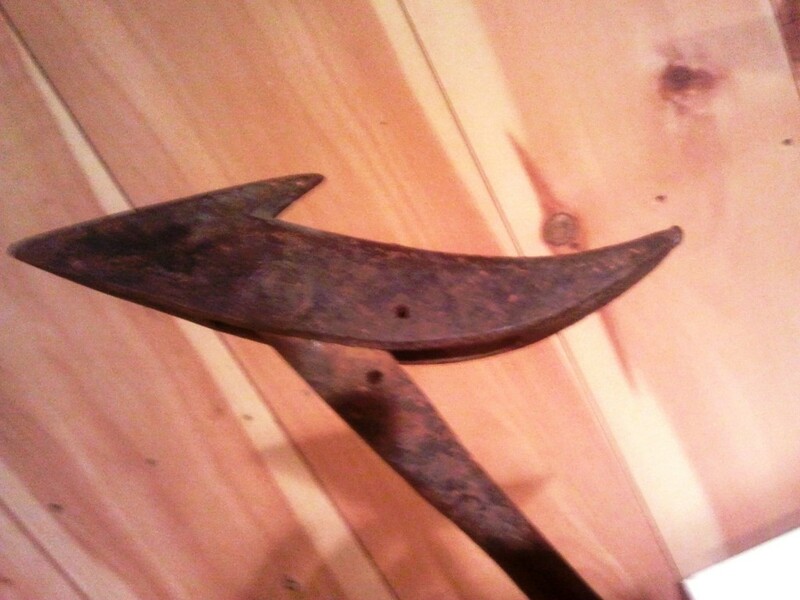 On the other hand, a piece like this old whale harpoon tends to be a bit easier to appraise. My buddy found this at a local yard sale and bought it for $10. He wound up reselling it for more than $900. I asked what specific features added to the harpoon’s value, and he said the piece’s high points were that it had a makers mark (Peters) and the fact that it had a good patina with remnants of its original red paint. It was about 33 inches long and dates to the turn of the 20th century, and would have had a wooden handle attached to it originally. During my dives for bottles, I have found solid brass propellers, brass rudders, even parts of ships wheels, like group of items that often offered on eBay. These are always easy to sell because people love to decorate their seaside homes with them, and they are items of much interest. Their values are determined in great part by condition, natural patina or original paint. Any giant-size brass item will have great value in general, and if a maritime item was expensive when it was bought a hundred years ago, you can assume the price will still be very high today. But the thing that drives the price higher is often the markings, especially the names of fishermen or fishing towns. To attach historical provenance and context to an antique related to fishing, shipping or boating—especially the whaling industry—makes investment in such a piece a safe bet; sometimes a better bet than having your money in a boring CD somewhere. These pieces bring back a romantic vision of working on the high seas, and ads character to any living space.